POS with Pride! – Bounce Sales & Marketing Ltd.
Bring a burst of Pride to your bookshop with Little Tiger’s #ProudBook POS pack. 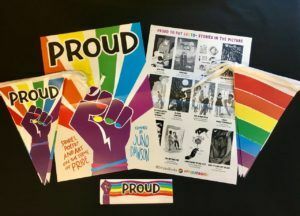 Each kit contains a set of Proud rainbow bookmarks, bunting to create a colourful display corner or window, an A5 flier with story topics and an extract of Dean Atta’s poem ‘How To Come Out As Gay’ and a folded A3 Double-Sided Poster with cover image and artwork. Bookshops can also download their Reading Group Notes and Recommended Reads List to host an in-store authorless book club event (see Bounce’s Events page for details). Also available: downloadable A4 Pre-order Poster for LGBT History Month and Double-sided Review Shelf Talker / Proud blurb for bookshelf displays and staff feedback.